Psychosocial problems during adolescence are heterogenic, rather common, and unstable. At the same time, they are associated with an elevated risk of developing psychiatric disorders later in life. We aimed to describe the trajectories of psychosocial problems during adolescence and examine potential markers of persistence as compared to remission of these problems. At baseline, 1841 adolescents (51.4% female) were included. 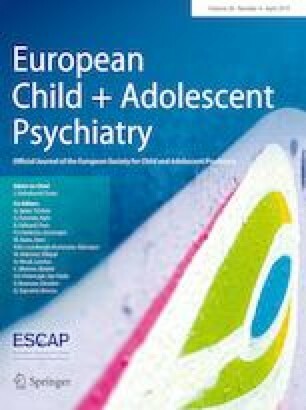 Of these adolescents, 1512 (mean age = 12.6 [range 11–14 years]; 52.8% female) completed the first and second self-report questionnaires on psychosocial problems (measured with the Strengths and Difficulties Questionnaire), psychotic experiences, trauma, self-esteem and somatic symptoms at two time points over a 1-year period. Regression analyses were used to examine the association between potential predictors and the trajectory of psychosocial problems (remitting versus persistent). Four trajectories were distinguished: 75.6% of the sample showed no problems (the ‘none’ trajectory), 11.9% were in a ‘remitting’ trajectory, 9.7% were in an ‘incident’ trajectory and 2.8% were in the ‘persistent’ trajectory. Hallucinatory experiences and trauma at baseline were significantly associated with persistence of psychosocial problems compared to those with remitting psychosocial problems. Low rather than high self-esteem was associated with lower risk for persistent problems. Risk of persistence of psychosocial problems increased with accumulation of predictors. Psychotic, especially hallucinatory, experiences and trauma predict persistence of psychosocial problems in adolescents. This underlines the need to assess psychotic experiences and trauma in mental health screening programs. This work was supported by The Netherlands Organisation for Health Research and Development, Grant number 417100004.